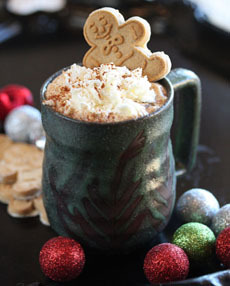  Topped with whipped cream that anchors a gingerbread man; photo courtesy The Hopeless Housewife. A pile of mini marshmallow “snowballs” with a caramel drizzle; photo courtesy Damn Delicious. 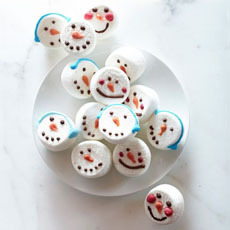 Snowman marshmallows; photo courtesy Williams-Sonoma. In a special Christmas mug: green and red pattern, Santa or reindeer motif, etc. With a candy cane, candy cane stirring stick or candy cane whipped cream. Garnished with whipped cream and red and green sprinkles or holiday spices: cardamom, cinnamon, nutmeg, star anise. Regular hot chocolate with a peppermint marshmallow. Peppermint hot chocolate with a regular marshmallow. 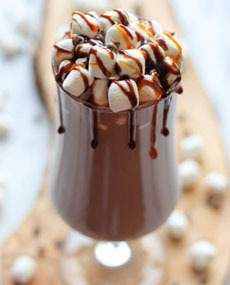 Regular hot chocolate with peppermint schnapps (or cherry, chocolate, coffee, orange or raspberry liqueur). With Christmas cookies, gingerbread or peppermint bark. With a cup rim of crushed candy canes. With candy cane ice cream instead of whipped cream. Mint white hot chocolate: Make white hot chocolate and tint it green. Holiday-themed to hand-melt in hot milk. A tiny gingerbread house cookie garnish (created by Megan Reardon; get the recipe at NotMartha.org), or a little gingerbread man whose arm hangs over the cup rim. NATURAL OR DUTCHED COCOA: DOES IT MAKE A DIFFERENCE? The words cacao and chocolate come from our ancient neighbors in Central America, who first sampled its joys. Cacao trees, which originated in the Amazon region, grew wild in the rainforests of ancient Mexico. They were cultivated by the native Olmecs and the Mayas who followed them. While the sweet white fruit of the cacao pod was initially eaten, Amazonian natives ultimately found that grinding and mixing the seeds with water produced an even greater treat: the original cocoa beverage. Chocolate has been a beverage for most of its history as a food. We know that more than 2500 years the Maya were making the cacao beverage; and perhaps as early as 1200 B.C.E. the Olmec were doing so. Hardly the sweet treat we know today, xocoatl (pronounced cho-co-LAH-tay) was served as a cold, unsweetened drink. The beans were crushed into a paste and whipped until foamy with pepper, vanilla, chili pepper, cinnamon, musk and cornmeal. Still, it was fatty and bitter; the foam was considered to be the best part. Christopher Columbus and his officers, offered the elixir as a great honor, found the bitter concoction unpalatable and couldn’t even choke it down. He had no idea the locals were offering him their most valuable goods for trade. Thinking the product abominable, he brought only a few beans back to Spain. Seventeen years later, Hernan Cortés understood its value, and promoted plantations run by Europeans. Today’s descendants of the Maya and Aztec still prepare cacao and corn-based drinks that are similar to those enjoyed by their ancestors. Here’s more on the history of chocolate.